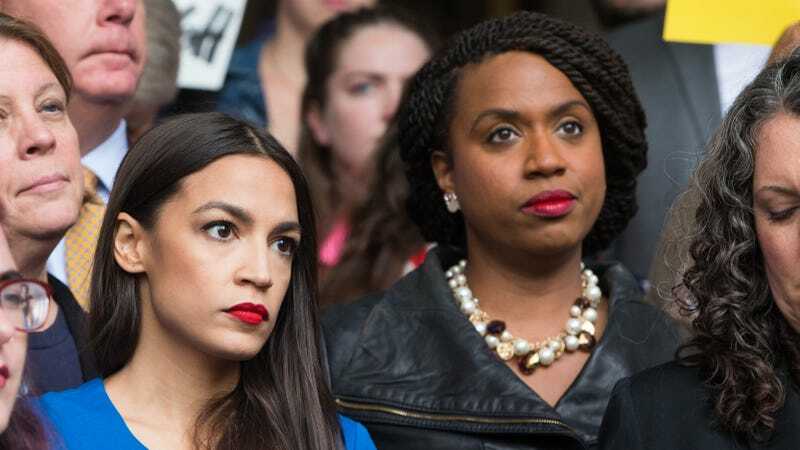 (l-r) Congresswomen-elects Alexandria Ocasio-Cortez (D-NY) and Ayanna Pressley (D-Ma) at a rally calling on Sen. Jeff Flake (R-AZ) to reject Judge Brett Kavanaugh’s nomination to the Supreme Court on October 1, 2018 in Boston, Massachusetts. Let’s be real: sometimes at the end of a long week (November flew by, but this week? Wheewww!) you need a little Friday jam to pick you up. A little inspo to power you through the last dregs of the workweek. If this is the case for you, may I present the following to crown your “rise and grind” mood board, served up by none other than Massachusetts Congresswoman-elect, Ayanna Pressley. Pressley dropped the photo Thursday night from her Twitter account. Gathered in the Longworth House Office Building in D.C., she stands alongside fellow newly-elected congresswomen Alexandria Ocasio-Cortez (N.Y.), Ilhan Omar (M.N. ), Deb Haaland (N.M.), Sharice Davids (K.S. ), and Veronica Escobar (T.X.). Given the setup and the fierce poses being struck (Okay Alexandria! Serve those eyebrow arches! ), it looks like a behind-the-scenes shot for an upcoming photo spread. Pressley wryly captioned the photo, “Album Dropping 1/13/19”—the day all these game-changing congresswomen take their oath of office. The history-making group has been going through Congressional orientation in preparation for their new roles come January, and they’ve been so in tune, their outfits are even synching.